We looked at the top 10 Garage Door Openers and dug through the reviews from 80 of the most popular review sites including CNET, Tom's Guide, faveable, Top Ten Reviews, Garage Door Openers, Garage Sanctum and more. The result is a ranking of the best Garage Door Openers. Our experts reviewed the top 10 Garage Door Openers and also dug through the reviews from 80 of the most popular review sites including CNET, Tom's Guide, faveable, Top Ten Reviews, Garage Door Openers, Garage Sanctum and more. The result is a ranking of the best of the best Garage Door Openers. The Chamberlain B730 Garage Door Opener lives up to the respected Chamberlain name, offering a sturdy, reliable door with smooth performance. You'll also get quiet operation and a backup battery that will let you use it for a while if the power goes out. Although built for standard 7-foot doors, you can purchase an extension kit if you have an 8-foot door. DWYM Home Experts plus BestReviews, Top Ten Reviews, The Tool Spy, A Web To Know, Car Bibles, Much Needed and 2 more. Along with user reviews from Amazon and Walmart.
" A premium product with the kind of features you find on heavy-duty units costing 4 or 5 times as much." "This Chamberlain garage door opener has a reputation for quiet operation. The secret is in its belt system, which is similar to a steel-belted tire, with flexible steel cords woven into the belt. This gives the opener capacity for strength..."
No matter what garage door you have, chances are the Chamberlain MyQ Smart Hub can help. It connects to your smartphone to let you communicate with your garage door. If you forget to close your door when you leave the house, you can set alerts to let you know. DWYM Home Experts plus CNET, Tom’s Guide, Engadget, Digital Trends, New York Times Wirecutter, faveable. Along with user reviews from Amazon, Best Buy and Walmart.
" The Chamberlain MyQ Garage is one of the most affordable smart garage-door openers, and also one of the easiest to install." "In order to use MyQ with Google Assistant or IFTTT, you have to sign up for a $1/month or $10/year plan with MyQ. That's a bummer. Also, it doesn't work with SmartThings or Alexa." The Genie Garage Door Opener will bring you powerful operation. It also has a soft-start and soft-stop feature that ensures your door glides gradually rather than jerking open. The garage door opener has one of the most advanced safety systems on the market as well. DWYM Home Experts plus BestReviews, Garage Sanctum, Garage Door Opener Review. Along with user reviews from Amazon and Home Depot.
" Great feature set includes soft-start and stop DC motor, 2 remotes, and safe T- beams"
"The first issue we discovered is the look of the keypad. It looks like it came from the 90s, which isn’t appealing. It is unclear why this manufacturer chose the design we can see when all the rest of the..."
You'll get easy installation with the Decko Garage Door Opener, which features non-polarized wiring. It also comes with an 8-foot extension in case your garage door is slightly larger than the 7-foot standard. An auto-reversal sensor stops the garage door in its tracks if an object is in the way. DWYM Home Experts plus BestReviews, Garage Door Opener Review, Much Needed, The Droid Guy, Garage Sanctum, A Web To Know. Along with user reviews from Amazon.
" A mid-level garage door opener with an efficient operating system that gives you what you need"
"Car remotes have very limited range"
We identified the majority of the garage door openers available to purchase. 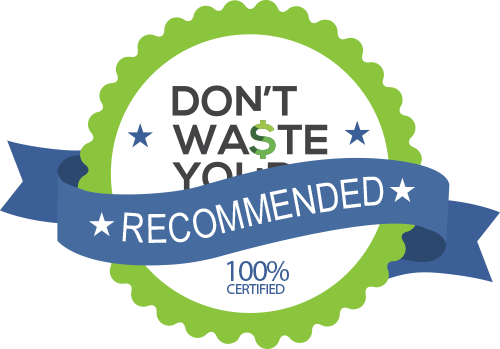 Reviews from our DWYM category experts and analysis of some of the most respected sources including: CNET, Tom's Guide, faveable, Top Ten Reviews, Garage Door Openers. We also incorporate user reviews from the leading retailers including Amazon, Home Depot, Best Buy, Walmart and 3 others. The Chamberlain has all the basic garage door opener features you'd expect, such as a steel-reinforced belt drive in a powerful 3/4-horsepower motor. It includes a battery backup that you can use when the power goes out at your home. A premium product with the kind of features you find on heavy-duty units costing 4 or 5 times as much. 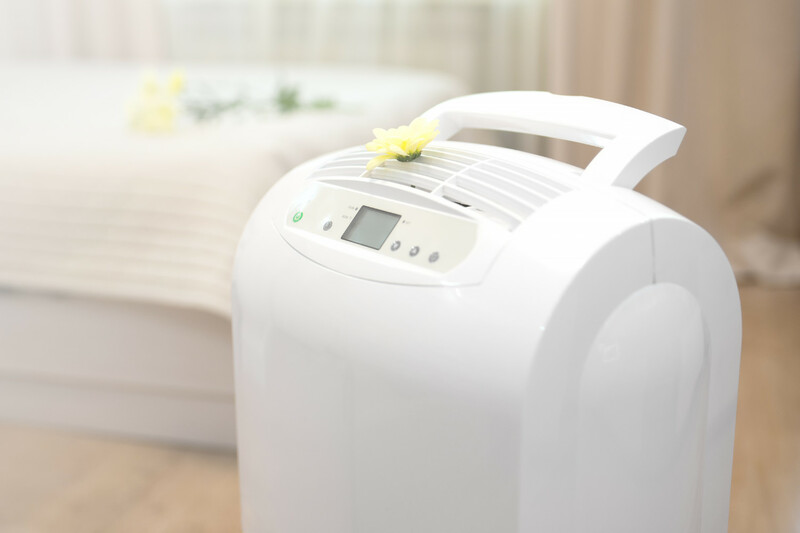 The Chamberlain Whisper Drive has an integrated backup battery that supplies the opener with up to 20 opening cycles in a 24-hour outage period. 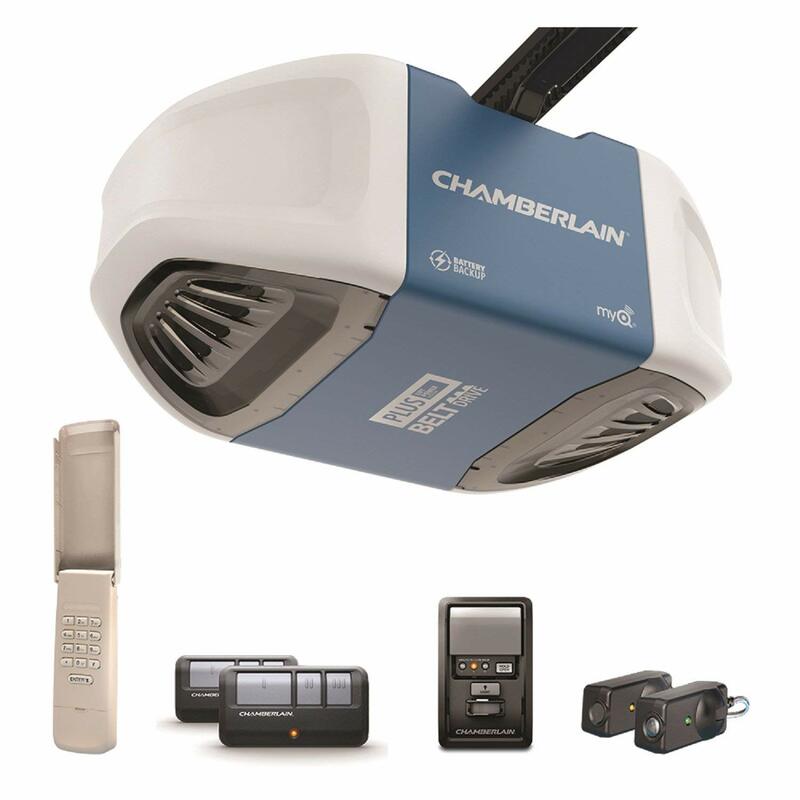 The Chamberlain B730 is a quiet and noise less garage door opener with ultra-strong steel reinforced and belted drive door opener for the garage equipped with anti-vibration technology. The Chamberlain B730 is HomeLink® compatible and has safety sensors. Battery back up for operation even during power cuts. The belt drive ensures quieter performance than comparable chain drives, and Chamberlain provides a number of other exciting features that help make this one of the best values on the market. The company’s Triband technology allows the garage door opener to have a range of at least 1,500 feet, giving you the ability to open or close it even if you’re some distance away from it. And this does not include a built-in MyQ. You’ll need to purchase the Smart Garage Hub if you want smartphone compatibility. Belt drive can wear out over time. The B730 has a maximum open size of 7 feet, which should accommodate most home garage doors. The Chamberlain MyQ Garage is one of the most affordable smart garage-door openers, and also one of the easiest to install. 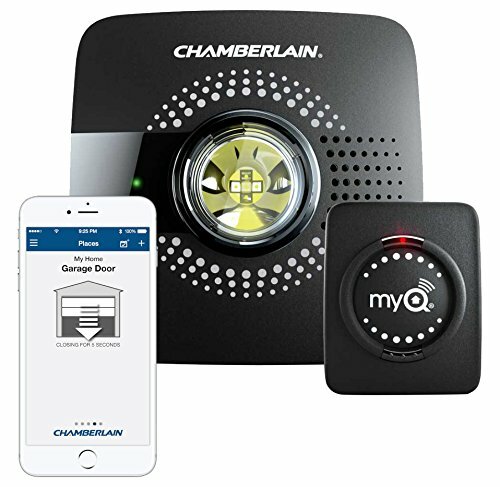 Chamberlain's MyQ device includes a sensor for your garage door as well as a hub that connects to your Wi-Fi network. When you send a command using your smartphone, it is relayed to the hub, which then goes to the sensor that activates your garage door. It was the easiest and quickest to install of all the controllers we tested, it's among the simplest to set up and use, and it's compatible with the most garage doors, thanks to the huge popularity of Chamberlain and LiftMaster products in homes across the country. The MyQ was the first smart garage-door controller to be manufactured, and it’s one of the simplest smart-home devices to install and set up. The app is well-designed and offers full remote control access and operation to your garage door, and it's compatible with a broad range of platforms. It works with a growing list of other smart home products, but notables like SmartThings and Revolv still don't have official support. In order to use MyQ with Google Assistant or IFTTT, you have to sign up for a $1/month or $10/year plan with MyQ. That's a bummer. Also, it doesn't work with SmartThings or Alexa. You can also connect the opener to Google Assistant or IFTTT, but this requires a small $1 monthly fee. False alerts have been an issue for some users. In our first round of testing, the device sometimes indicated that the door was open when it was actually closed, or vice versa; a number of our editors who have MyQ units in their homes have had similar experiences. The learning curve on the app can be a bit steep, and this opener is prone to software and connectivity issues. Without a garage door opener, you’d have to manually lift the door every time you needed access, which would be especially annoying if you parked your car in there. A garage door opener is a modern convenience many people take for granted. If your home has an opener already, chances are it was already there when you bought the house. But you don’t have to wait until it malfunctions to replace it. In fact, you may find that you can upgrade to a quieter, more efficient model that offers capabilities you don’t currently have. One feature found with many modern garage door openers is battery backup. This means instead of dragging out a ladder and trying to find the cord to release the door, you’ll be able to continue to use the garage door until the power comes back on. Keep in mind, though, that you’ll be limited in the number of times you can open and close your garage door before the backup runs out. You’ve likely noticed that some garage door openers are noisier than others. Although you can purchase a new garage door opener that will offer this feature, you can actually purchase a noise reduction kit for a fraction of the price. You’ll also save yourself the trouble of switching out your existing garage door opener if noise is your only concern. You also don’t have to buy a new garage door opener if you simply want mobile connectivity. The Chamberlain MyQ Smart Hub works with most garage door openers and gives you control over your remote from wherever you are. If you leave for work in the morning and can’t remember if you closed your garage door, you’ll no longer have to turn around and go back to check. Just open the app on your smartphone and, if you forgot, close it and go on with your day. You can also set notifications to alert you if you leave the door open. Garages are for parking vehicles, right? Despite the fact that garages are often associated with automobiles, some people don’t use it for a car at all. In fact, one in four people admit to having a garage so cluttered, not even one car will fit inside. Many still do use it at least partly for one or more vehicles, but storage is another top use of garage space. Other consumers say they use the garage for hobbies, working on cars and exercise or sports. As yards grow smaller, some people find that they have no room for the storage sheds that could be used to store items like yard tools, making the garage the only option. Although you’ll certainly hear about other features, one thing matters most when it comes to a garage door opener: the motor. Your opener’s motor powers everything, so you’ll want one that is built to last. The Chamberlain B730 Garage Door Opener, Genie Garage Door Opener and Decko Garage Door Opener have ¾-horsepower motors that provide reliable, smooth performance. The Chamberlain B730 Garage Door Opener uses a steel-reinforced belt drive, adding to that advanced capacity. Some garage door openers slam the door into its final position. The Genie Garage Door Opener uses a soft-start and soft-stop to ensure your door lands smoothly. If you’re looking for a less noisy garage door opener, the Chamberlain B730 Garage Door Opener specializes in keeping noise to a minimum. It also has antivibration technology. If your home’s power goes out, you’ll have to use a manual bypass to open your garage. The Chamberlain B730 Garage Door Opener’s integrated backup battery lets you open your garage door up to 20 times during the 24 hours after your power goes out. If you’re installing the garage door opener yourself, the Decko Garage Door Opener has non-polarized wiring, which makes it easier to install than many of its competitors. It’s important to measure your garage door size before you buy. Many garage door openers are built for 7-foot garage doors, which are standard. However, some newer garages have doors that are either 8 or 10 feet. 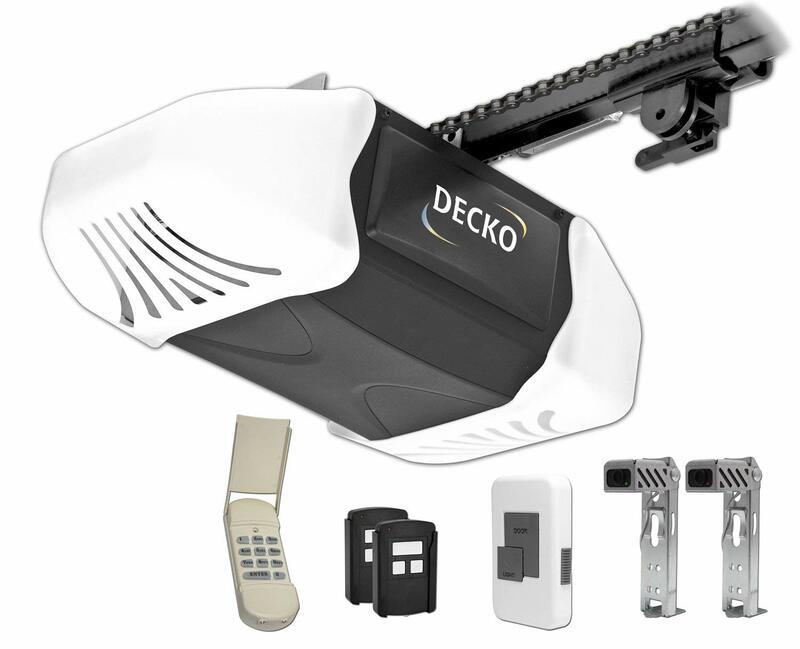 The Decko Garage Door Opener comes with an 8-foot extension. 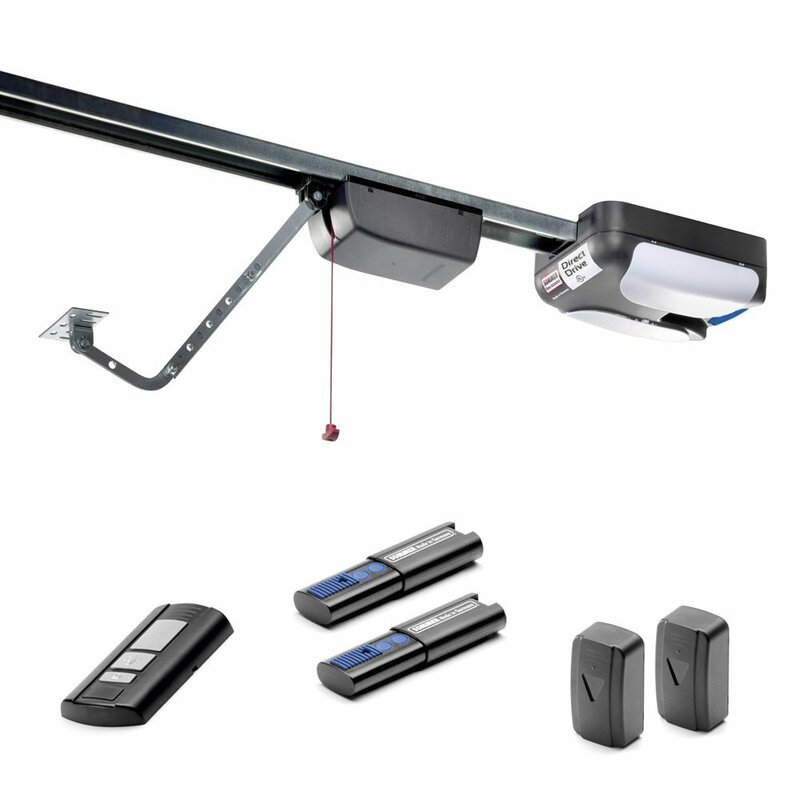 If you buy the Chamberlain B730 Garage Door Opener, you can separately purchase an extension kit that will make it work. Smartphone compatibility is a hot feature in today’s garage door openers. For less than $100, you can purchase the Chamberlain MyQ Smart, which works with most garage door openers manufactured after 1993. Using the MyQ, you can open and close your garage door from anywhere, as well as set alerts that let you know when your door is left open or opened unexpectedly. If you’re most interested in smartphone features, steer clear of the Decko Garage Door Opener since it isn’t smartphone compatible. You likely won’t need your remote if you have a newer car with HomeLink built in. The Chamberlain B730 Garage Door Opener, Genie Garage Door Opener and Decko Garage Door Opener are all HomeLink compatible. Most garage door openers use sensors to stop the door from closing if an object gets in the way. If you have children or pets, this is especially important. 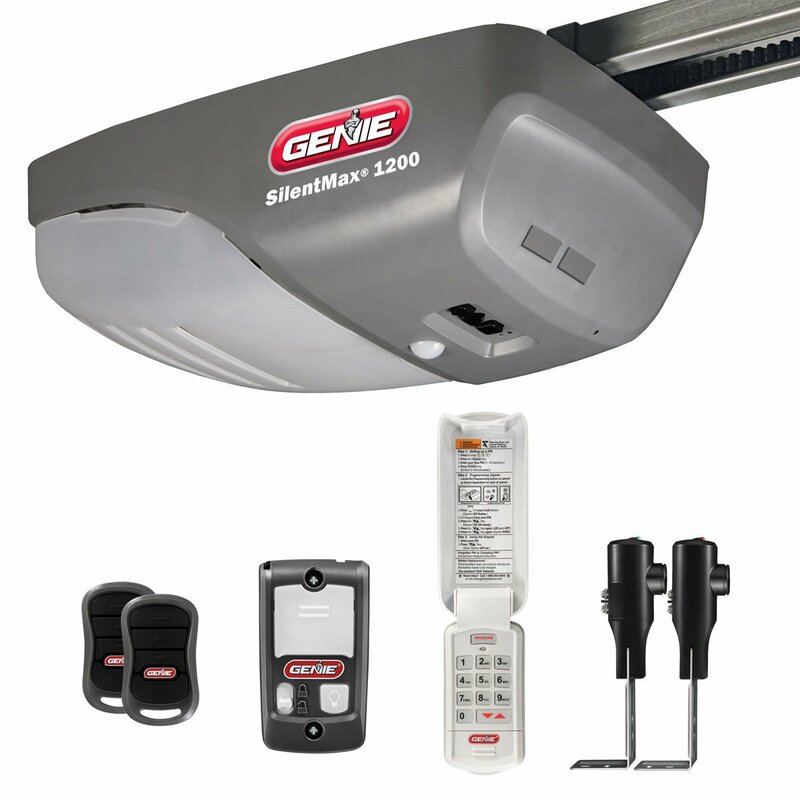 The Genie Garage Door Opener has one of the most dependable safety systems available on garage door openers today. The Decko Garage Door Opener uses an auto-reversal sensor that also stops the garage door when an object is detected. Many garage door openers have a limited range, which means you’ll practically have to be parked directly in front of your door to get it to open using your remote. The Chamberlain B730 Garage Door Opener has a range of at least 1,500 feet to let you get the door started as you’re nearing it. One benefit of the Genie Garage Door Opener is its wireless entry keypad. Instead of needing to have your remote with you to enter through the garage, you can input a series of numbers and enter that way. Price may be a consideration, but the Chamberlain B730 Garage Door Opener, Genie Garage Door Opener and Decko Garage Door Opener all retail in the $200-$300 range. If you want smartphone capability, you’ll need to set aside another $100 or so to buy the Chamberlain MyQ Smart control. For the Garage Door Opener category, we analyzed 80 of the most popular reviews including reviews from CNET, Tom's Guide, faveable, Top Ten Reviews, Garage Door Openers, Garage Sanctum and more. The result is a ranking of the best Garage Door Openers.